Not at all. It’s such a nice office. Today, I’m here to conduct a new challenge. 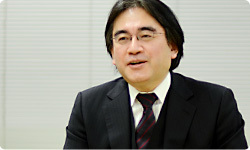 Most sessions of “Iwata Asks” so far have dealt with a specific software or hardware, but since we have become closely acquainted with PlatinumGames1, I thought it would be good if I could talk about PlatinumGames as a development group, rather than about a specific product, and I asked for your time. I’m not sure how this will turn out, but I’m looking forward to it. Thank you.1. PlatinumGames Inc.: A video game developer founded in 2006. 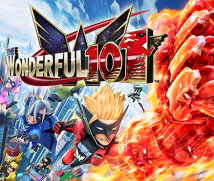 The company is currently developing The Wonderful 101 and Bayonetta 2 games for the Wii U console. Head office: Osaka. You’re both prominent figures in the gaming world so I’m sure many of the readers would know who you are, but would you please introduce yourselves? 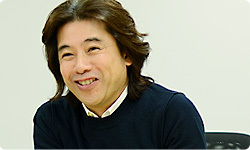 I’m Minami, president and CEO of PlatinumGames. I’ve been in the industry for about 25 years. First, I was involved in development at a publisher company for a long time, but about seven years ago, for various reasons, I established PlatinumGames. The biggest reason for founding the company was that I wanted to create a group that specialises in making something. I want to achieve as an independent developer what can’t be done at a large organisation such as a publisher. In order to make this distinctive group of creators into a world-class team, I’ve stepped back from the development work in order to focus on representing the company. 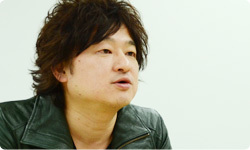 I’m Inaba from PlatinumGames. 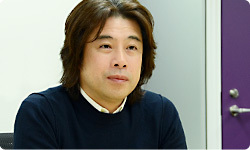 Like Minami-san, I came to this industry from a publisher, and about 20 years have passed. I was originally a programmer, but since becoming a producer, it’s been about ten years. I’ve mostly produced original titles. It isn’t often that one gets to always take on original titles the way you do. I suppose that’s because you share an understanding of each of your roles and sort of role-play2.2. Role-playing: Performing a set role. Okay, first I’d like to ask about how you first encountered video games. About the time we started making video games, the industry wasn’t as large as it is now, so I imagine that, from that first encounter, there were a lot of interesting twists and turns. Minami-san, where did you first encounter video games? I’ll turn 50 this year, so my memories of my youth are of arcade games. At the time, Space Invaders3 and Donkey Kong4 were popular, so I was playing games like that at the arcades. But I was just a player then and didn’t link it to an occupation at all.3. Space Invaders: A shooting game that appeared in arcades in 1978.4. Donkey Kong: An arcade game that appeared in 1981. The Famicom (the Japanese name for the NES) version was released simultaneously with that system in July 1983. In other words, it didn’t occur to you that video game companies might be a place to work. Right. At the time, there was nothing like video game technical schools, so the path to working in video games wasn’t as clearly laid out as it is today. Even to people who fervently frequented video arcades, it was a mystery who was making the games they played and how they were making them. Yes. So I never imagined making video games as a job. Then, after graduating from high school, I started attending design school. One time, my peers and I had to work on a group project. They gathered at my house, and one of my friends brought over an NES so we could play with it during breaks. It wasn’t! (laughs) That’s when I first encountered the Super Mario Bros. game. Instead of just using it for quick breaks, we got absorbed in it! But we made progress on Super Mario! (laughs) That’s how I encountered home video games, but even at the time, I had no thoughts of getting a job in the game industry. How did you come to work at a video game company then? I was studying graphic design at design school and dabbling in things like early computer graphics, and I was also incredibly interested in computers. So when I looked for a job, my criteria were, above all, a company where I could use a computer, and a company with the best conditions as possible. I found three in the Kansai area and they were all video game companies. There are similarities between pixel art and drawing with traditional art materials, but the work is largely different. Completely different. That was the biggest culture shock. What work were you first involved with? Yes. For the first year, I studied the consumer titles that other companies were making, and as a designer, I created pixel art. But at some point I realised I didn’t have a talent for it. It’s surprising to hear someone like you say you don’t have talent. You mean you just weren’t suited for pixelated art? And that was a turning point in your life. Yes. I guess that was a little more suitable, and it led to me being a project planner, director, and then producer.